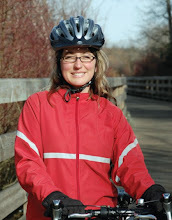 Lana Popham's 2009 Campaign: From the "Saanich News" this week. Lana Popham, in her Saanich kitchen with her dog, George, shows the variety of cloth bags she’s collected. Popham is proposing that all plastic bags be banned from the CRD by late 2008. Lana Popham’s on a mission. The Saanich resident is sick of seeing plastic bags plague the environment – killing animals, clogging drains and littering yards and streets. Her plan is to go right to the top – CRD’s Solid Waste Committee – to ask that all plastic grocery bags be banned from the Capital Region by the end of 2008. “The plastic bag situation is so wasteful and the amount of harm it does to our environment is astounding when you read about it,” Popham said. The committee meets in December. Popham will have five minutes to plead her case, then it’s waiting time until she gets a yay or nay from the committee. Popham’s goal is to initially only have plastic grocery bags banned. Eventually, though, she would like to see no plastic bags at all in the region. Canada’s Environmental Protection Agency estimates only 0.6 per cent of plastic bags are recycled. Saanich’s Hartland landfill has been looking at the possibility of a plastic bag recycling program, but recycling plastic bags is very difficult, said Alan Summers, senior manager of solid waste for the CRD. It would require all bags be turned inside out and possibly rinsed to remove crumbs and spills, called contaminants, that make recycling impossible. Summers estimates plastic bags make up less than one per cent of waste that lands in Hartland Landfill, but the actual number of bags thrown out is too hard to guess. He added many plastic bags at the landfill get there because they’re reused as garbage bin liners. Leaf Rapids, a tiny town of 550 people in northern Manitoba, became the first community in Canada to ban plastic bags. It imposes a fine of $1,000 to retailers that distribute single-use plastic bags and have seen a dramatic reduction in use of the bags, according to a CBC report. There are several alternatives to single-use plastic grocery bags. Thrifty Foods switched to distributing only biodegradable grocery bags in August. These are expected to break down in two years, as opposed to as much as 1,000 years for non-degradable bags. But the CRD says degradable bags aren’t recyclable and can even contaminate other plastics. Several grocers, such as Thrifty Foods and Safeway, have bins in-store to collect grocery bags for recycling. Popham has switched to reusing plastic grocery bags and going shopping with cloth bags. Thrifty Foods offers a three-cent refund for shoppers who reuse bags. It’s also feasible to not use bags at all, Popham says. Communities such as Rossland in the Kootenays have passed bylaws banning plastic bags. There’s no enforcement, though, and compliance is voluntary. “I don’t think that’s good enough. It’s not helping,” Popham said. The ban has to be absolute. In the meantime, Popham is doing what she can to spread the word and try to convince other people to break their dependency on plastic bags.